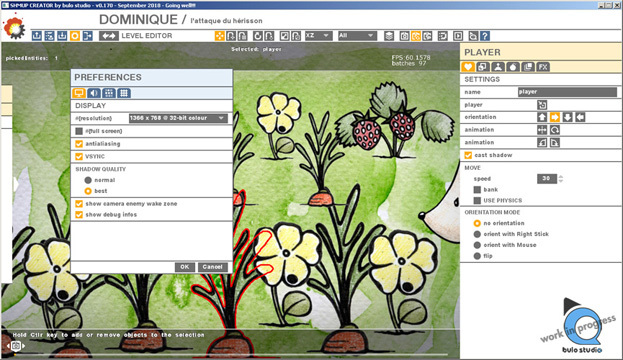 We added some colors in the editor panels and windows. The UI was very white and is now more colourful. But the real reason was to add an information about the scope of each editors: does it modify some features of a level, or does it modify some features of a whole game? The distinction is important: the lighting or the fog is a level feature. Modifying the lighting of the level 1 will not change the lighting of the level 2. 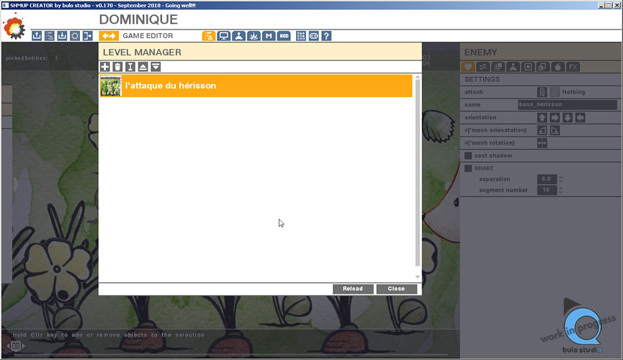 But modifying the player properties will modify the whole game because the player is shared in every level. This is why in the SHMUP Creator the game properties are blue and the level properties are yellow. 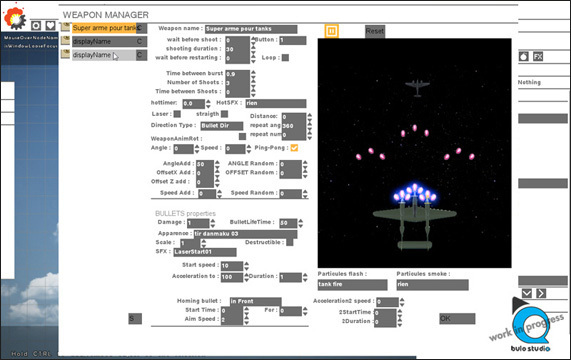 The weapon system in the SHMUP Creator is simple and powerful. 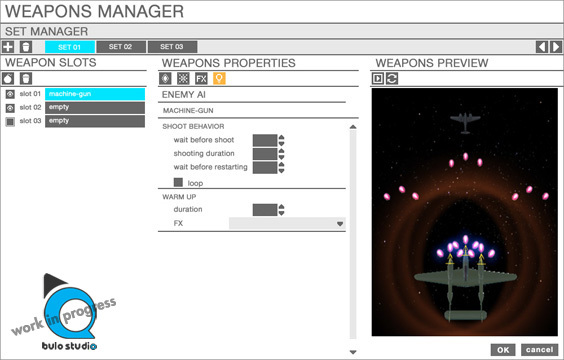 It works like this: you can create weapons for an enemy, and each weapon uses a weapon definition. It means that you can have two weapons at each side of the player using the same definition, which is quite handy because you only have to modify the definition to modify the 2 weapons. Another thing is that you can have several weapons sets. A set is a collection of weapons for a player or an enemy. You could create set called basicWeapons, a set called mediumWeapons and a “superBonusWeapons” set, and use one or another depending of the item the player takes. Or you could use a power-up to go from the basicWeapons set to the superBonusWeapons set. Or you can use a set for an enemy, and use another one when the enemy goes to a particular waypoint. We modified the layout of the Weapons editor to reflect this mechanic: a Sets column, then the list of the weapons of the selected set, then the weapon properties, and then the realtime preview. The new editor is sequential, and we hope, is more easy to grasp. A lot of time when I add a new features I prototype quickly an editor. 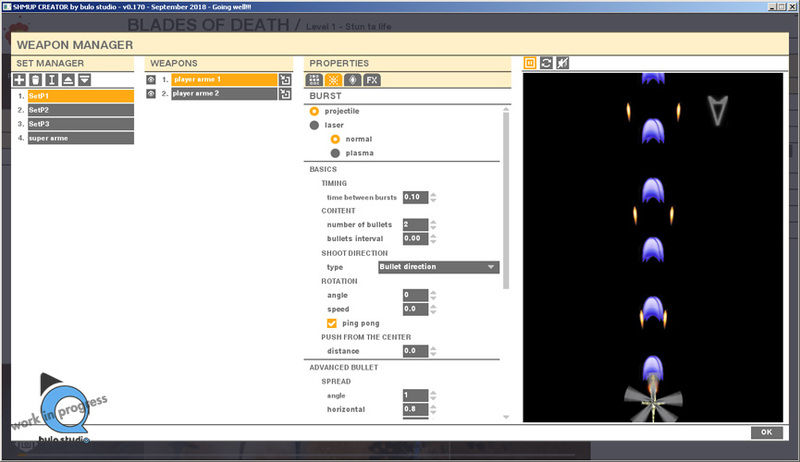 The explosion editor was still in its prototype form until now and was, quite frankly, a complete mess. Mathilde redesigned everything and I had to re-code some part of it. But at least, it’s really better now, and follow the Weapon editor philosophy. And as always, we are polishing each part of the SHMUP Creator editors one by one. We added new icons, modified old one, moved things…. Still quite a lot of small adjustments to do, but the end is now close. We still have to complete our work on the weapon and explosion editors. We need to review the control settings editor, the about panel, correct the last bits and pieces. All this should be complete at the end of September. I hope to be able to resume my work on the 2D sample game next. Hello mate. Have been watching this project for some time. I was wondering about pricing and also export options?